Launch of refurbished and fully functional maker-space promises out-of-the-box learning that encourages creativity and collaboration. 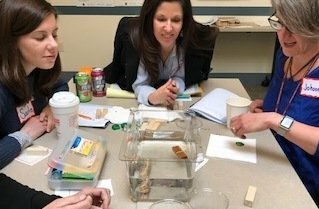 In the fall of 2018, the Concord School District will officially launch its Innovation Lab, a new ‘maker space’ where elementary students can gather to share ideas, and use tools and equipment to design, tinker, build and create solutions to design challenges in Science, Technology, Engineering, Art and Math (STEAM). During the 2017-18 school year, the pilot lab provided an offsite learning environment for professional development and trial lessons that engaged and inspired young and mature learners alike. Located in the former Ripley cafeteria, the refurbished and fully functional Innovation Lab promises a fun, creative safe place for students to engage in a range of STEAM projects such as prototyping product designs with 3D printers, programming robots, creating art out of recycled items, and designing solutions to grade-level engineering challenges that are tied to the science curriculum.